Thank You kind Sir! The story behind Ghostrider is I had to do a cool piece of art to try and make up for how bad the movie was, and the fact that I took my wife to see it with me. Awesome work on the cards man! 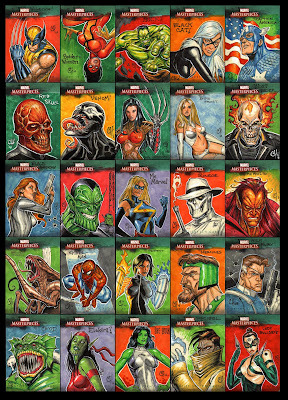 That Spider-woman is amazing, I want it. Way to go, Chad. My favorites here are Captain America and the Scourge. Eisu and Dapper Dan. I want to Thank you guys for the complement again and wanted to add that you're cards are great as well. Dapper, I've added your blog to my links so I and my readers can check out what you're up to! Ron thank you also! I added a link to the Pulp Factory blog which looks great! I'm reading Johnny's Agent X story as well as my Captain Hazzard Books and I am having a blast! @ Matt: Hey bud! Thanks for the complement. It is always good to hear from old high school chums! @ Jason: Thank you sir. Hey dude! I syumbbled accross your blog as I was checking out other peoples MM3 cards. I did 30 myself for this particular set. Yours turned out really nice! For all of you not familiar with what Jon's doing make sure you check out Gemini by Jon and my bud Jay Faerber from Image Comics!